← Big Spoon Roasters – Nut Butters Handcrafted in Durham! The second weekend of October continues to be packed with a variety of things to do. Live music, Porsche exhibit at NCMA, food trucks, and competitive badminton top my picks for things to check out. There truly is something for everyone going on this weekend! Enjoy! Sola Coffee regularly hosts live music each Friday & Saturday around 7:00pm. This Friday they play host to local bluegrass band Ravenridge. While you’re there check out Sola’s new dinner menu featuring pizzas, cheese plates, bruschetta, and new wine & beer selctions in addition to their great coffee! 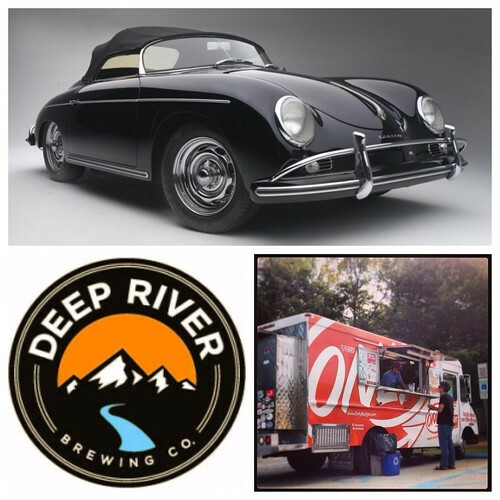 Have you been to Deep River Brewery in Clayton yet? I samples a few of their beers at a recent event and they are fantastic. This Friday the Brewery is open and the taps will be flowing. D’Burritos, a relatively new food truck featuring tex-mex dishes will be at the brewery selling food to feed the hungry local beer fans! Midtown Events is hosting the last Friday Night Tribute band block party of the season this Friday night from 7-9pm on Park Street at North Hills. This Friday enjoy the tunes of the 1980’s tribute band The Breakfast Club! Porsche by Design: Seducing Speed marks the North Carolina Museum of Art’s first design exhibition, exploring the history and development of the Porsche lineage from the 1930s to the present day. Featuring 22 automobiles, Porsche by Design presents cars owned by Ralph Lauren, Steve McQueen, & Janis Joplin, as well as the one-of-a-kind Panamericana concept car on loan from the Porsche Museum in Suttgart, Germany. The exhibit opens this Saturday October 12th and runs through January 20, 2014. Donnie Howard returns to the Uncorked Wine Bar in Falls River this Saturday night at 6pm. Enjoy craft beers and a wide variety of wines while listening to his great acoustic performance. Donnie will be joined by Chuck Brown on percussion. Rebus Works is hosting Pop A Top: A Food Truck Rodeo that will pair up seven food trucks with seven New Belgium canned beers. Pop A Top will include a Food Truck Rodeo, DJ, local art and craft vendors and New Belgium Brewing Company will have a “do it yourself” koozie silk-screening table manned by Oak City Collective. There are a total of seven pairings and all the trucks will offer a $4 sample dish to go along with the $4 beers. A music lovers’ paradise, Shakori Hills is a family-friendly celebration of Music, dance, art, & education. 4, days, 4 stages, & over 60 bands in beautiful Chatham County. Make sure you stop by the Coffee Barn for some Larry’s Beans Coffee! Festival runs Oct 10-13th! Looking to enjoy something a little different this weekend? Badminton is an incredibly popular sport outside of the united states, but you have a unique opportunity to watch a host of competitive Badminton matches this weekend at the NC Adidas Open being held at NC State Oct 11-13th. Local resident Leon Grodski de Barrera of CocoaCinnamon in Durham will be competing in a match this Saturday at 9am. You can view the full tournament schedule here. Downtown Raleigh is set to host another huge Food Truck Rodeo this Sunday from 12-5pm. There will be over 50 food trucks lined up and running several blocks along end Fayetteville Street. There will also be beer and coffee for sale and seating. There is sure to be a crowd, so get there early and avoid the long lines!